Animated fantasy actioner for children and young teens, about Hiccup who gets an unexpected friend and plays an unusual role in the Viking village. The Viking movie genre is so full of fantasy that it is not a surprise that Dreamworks decided to make a Viking film with dragons. 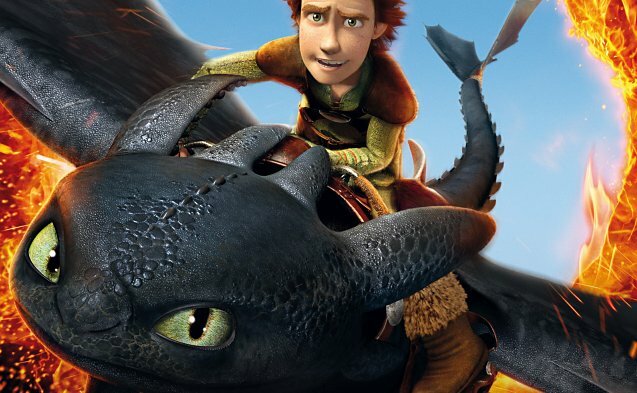 Of course, dragons are already connected to the Vikings through their own beliefs, their longboat dragon bows and their folktales, and coupled with the popularity of dragons in current fantasy litterature, How to train your dragon seems to arrive at the right moment in time. 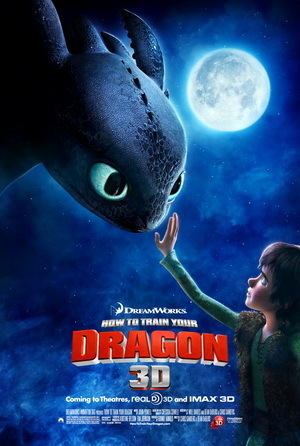 In the film, Hiccup, a 12-ish year old son of the Viking village chief, is reluctant to learn to kill dragons, which are a natural part of the Vikings’ life. From small, almost cute dragons to big town-crushing ones. Hiccup wants to be a blacksmith, and he’s even skinnier than the girls, so his father’s hope for Hiccup to become a real Viking does not really happen. 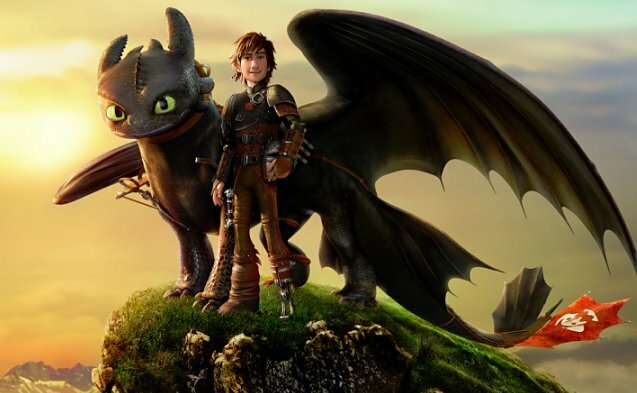 One day, Hiccup accidentally encounters a dragon who hides in the woods, as it cannot fly. 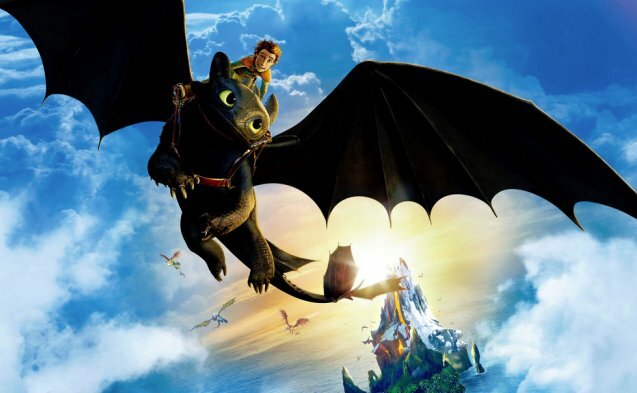 Hiccup learns that the dragon is not evil, and builds a mechanism that allows the dragon to fly again. From the very beginning, the movie is filled with action scenes of various kinds. And it never stops – this is one of the most action filled children’s movies I have seen! There is never a boring moment, but the focus on rollercoaster dragon rides also means that both character development and the story itself suffers. Case in point; there are only about four or five characters of importance in the film, and that includes the dragon. And contrary to what you think, Hiccup is not one of the characters that sees a nice character arch; his father the Viking lord and the main female character, a girl of Hiccup’s age, are more interesting. Hiccup is pretty much the same boy throughout the film, which may or may not mean that he was a really good guy with high standards and didn’t need any character development. But it does make him less interesting. Hiccup is a bit goody two shoes for my taste. Nevertheless, the focus on action and lack of serious writing is probably intentional in this case. It’s a movie for the tween generatoin, and layering too much is probably something the writers and directors tried to avoid. Still, I whish they could have crafted the characters in a smarter way, and shown us why we should care about all the Vikings in the film being attacked by dragons, and not just the sweet Hiccup. Additionally, the film is very much a “reluctant heir refuse to follow in dad’s footsteps” type film, which we have seen so many times before (and not only in Viking films). On the other, and I might be underestimating the audience here, it’s the action that counts, and since there is plenty of it, and nicely done too, children of all ages will be entertained. Dragons and Vikings, what is there not to love? And those beards! 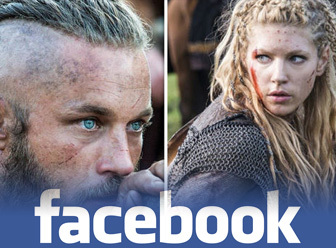 On the always important Beardometer, this Viking movie is hard to beat! If you can overlook the many historical anachronisms (not a problem in children’s fantasy films) all you need to do is fasten your seatbelt and enjoy the ride! Directed by Chris Sanders and Dean DeBlois.